The 2010 pantomime at the Grand Pavilion, Porthcawl is Jack and the Beanstalk. It runs from 11th December 2010 to 2nd January 2011. 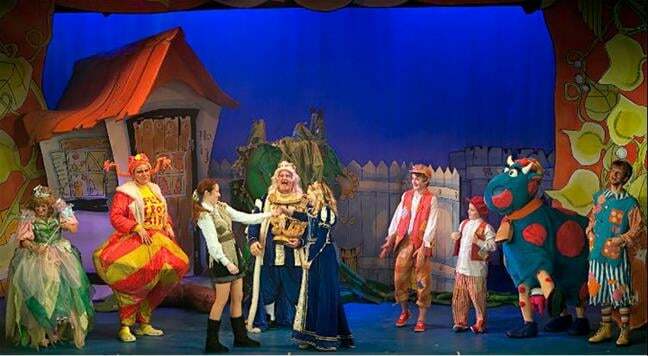 More information is available on the venue's pantomime webpage and our Facebook photo album. You can also follow us on Facebook to keep up with all the pantomime news! "Fantastic show, we all really enjoyed... Once again you have pulled it off!" "It was amazing! Thank you very much"
".. it was brilliant! Well worth coming all the way from Ammanford"
"I really enjoyed it and I'm coming again"
"Simon Trot you are a legend... made me laugh so much"
" It was great! Really enjoyed can't wait to come and see it again"
"Just got home!! Aww it was really good I have two very excited children". Hope to see you all back in Porthcawl for Cinderella in 2011/12!! Dave the Cow's a winner! The Grand Pavilion and Imagine Theatre were utterly thrilled when Dave the Panto Cow was officially announced as the UK's favourite pantomime cow for 2010, following a nation wide search by ice-cream masterminds Ben and Jerrys. Thank you so much to all who voted!! Ben and Jerrys are running a UK's favourite panto cow competition - and Porthcawl's very own panto cow, Dave, has been shortlisted in the final 5! Have you added Dave as a friend on Facebook? On 28th July, Brian Hibbard, Gillian Elisa, Stefan Pejic and Dave the cow all met up in Porthcawl to launch the panto. It was a fantastic day with laughter abound! It's shaping up to be a fantastic show! Here are some of the photos of the day. Stefan Pejic joins us for a second year, having played Willy Do-it last year. This year Stef takes on the role of Simple Simon. What's occurin' Stefan?! Also joining the team is the brilliant Gillian Elisa. She will be playing the role of the fairy. We are delighted to announce the first two cast members for Jack and the Beanstalk. Brian Hibbard joins us for the first time to play Fleshcreep and Vern Griffiths returns for the third year to play Dame Trott. We're thrilled to be working with them both!